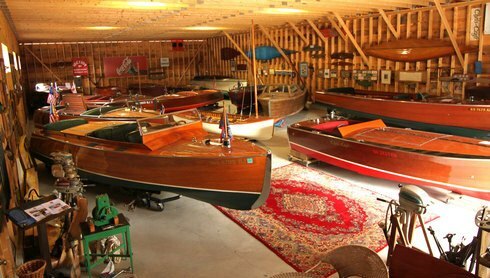 of your antique boat or vintage auto. New pages will cover . Parts- Hardware. 26 Year collection. Custom Builds. For home, office, business. 2019 Auction. Purchase or sell boats, autos. Boats For Sale. Brokerage and showroom. electric boat built in Central N.Y. Clayton show winner with new frames, decks and interior. There are no batteries with the boat, trailer included. From a large collection we are offering. 1938 Chris Craft 25' triple cockpit w/ replacement bottom by Muller Boat Works Sunapee N.H. Powered by a GM 427 w/ 200 hours. Fresh varnish, Dietrich top and factory lockable aft cockpit covers that can be stored in the engine bay. Rare Runabout in excellent condition, available for water test in N.H.
To see the photographs at a larger size, please click on that boats image or on the hyperlink next to the photo Click here or call (603) 345-3765 if you need more information on a specific boat listed. Super Deluxe Runabout ,Clayton show winner in preserved condition, 98% original wood powered by a 1947 Evinrude 22HP Speedy Twin with low hours, trailer included. Part of a large collection we will be offering. hull # 145 powered by a GM 283 185 HP V8. Bimini top and side curtains. Good driver could use deck refinish. No trailer possible transport depending on location. Milton Showroom. powered by a rebuilt original Chrysler 331 Hemi. 200 photo disc available of the 5 year restoration of new sides, decks, transom, frames, upholstery, 5200 bottom, chrome + instruments by Kocian. Inner diagonal planking is mahogany, no plywood used in the rebuild of this boat. Multiple show winner including Best Chris Craft in Clayton N.Y. 2 Layer waterline + transport cover, canvas lined with felt. Includes a custom fitted Venture trailer. Excellent condition, Ready to show. 1952 22' Chris Craft Sedan powered by a Ford 302 V8. Canvas cover and tandem axel Continental Trailer. Milton Showroom. New decks, transom, coamings, ceilings and hatches. Good bottom, topsides stripped and 2 planks replaced. Seat frames and flooring pieces present for patterns. All underwater hardware present, deck hardware includes windshield, bow light, stern socket, lift rings, fuel cover, rub rail, vents, chocks. No engine or trailer. Delivered with CC A120 and was a ride boat in NY State. Milton Showroom. powered by a rebuilt 0 hour Chrysler Crown. Complete original hardware, gauges, panel, wheel+ dash switches. Very rare boat with new 5200 bottom and Winsor trailer. powered by a 4 cyl CC Model B engine. New 5200 bottom, upholstery, fuel tank, lines, cloth wire, correct flooring and total refinish. Rare one year build with Cedar sides, ceilings and dash. Complete original hardware, not run since restored. Excellent condition, ready to show. Trailer included. Milton Showroom. Hull # 2584 with Original rebuilt Chrysler Imperial 125 HP 6 cyl # LM4376 with Holly Downdraft . 5200 bottom, 90% new wood, cloth wire, 6 volt system, Continental trailer, gauges restored by Clawson. Best Restored awards 2 years at RDC Chapter Gaston Lake N.C. Excellent condition, ready to show. w GM 454 300 hp under 400 hours. New bottom and refinish in 2002. Tandem Kla ssic trailer with new hydraulics and break system, AM,FM,CD and full waterline cover all in excellent condition. Ready to run. 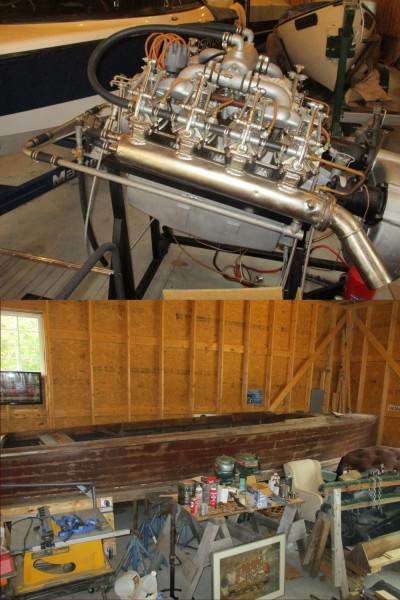 built by Rochester Boat + Engine in Rochester NY, very rare with original gauges, panel, hardware, wheel. powered by Lycoming. 98% original wood, Meredith NH first place 07. Full cover included. Hull # 71153 re powered with Mercruiser V6 + new upholstery. Trailer + original Model B engine included. Very nice pre war runabout. w/ 0 hours on the original rebuilt Universal 6. New west bottom, new wood on sides, decks, transom. New wire, upholstery + restored original gauges + panel. Engine by Mark Wilson. Trailer included. Milton Showroom. Hull # 3038, Tahoe boat all original equipment except repowered to a 440 Chrysler. 1 of 137 built. Trailer and waterline covers. 5200 bottom, new sides, decks & transom. New 5.7 GM 310 hp, fuel tank, wire, upholstery, 6000lb aluminum trailer. Exc cond. Model B engine, complete boat. Milton Showroom. Original Kermath. Complete one owner boat out of 40 year storage. Milton Showroom.